Normally, Speedy Route will calculate an optimally ordered route between all your locations that visits each location once in the quickest time and shortest distance. A location must be visited before a certain time of day. A location must be visited after a certain time of day. A location must be visited only between two different times of day. An amount of time must be spent waiting at a location before moving on to the next location. 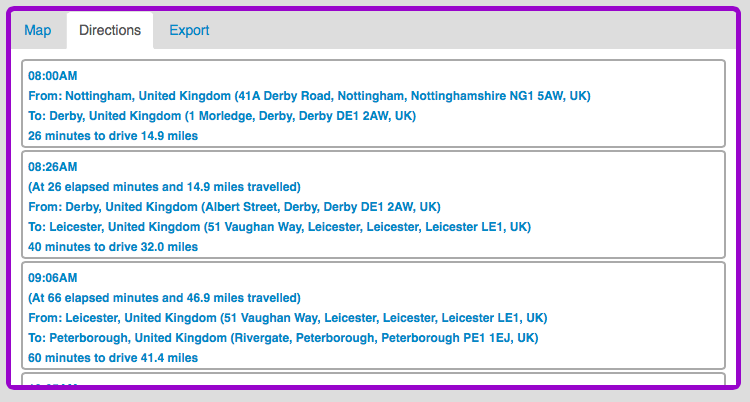 Speedy Route will attempt to incorporate such route restrictions into its calculations if they are specified via the new 'Location Timeboxing' functionality. The 'Route Start Time' - defaulting to 8AM. 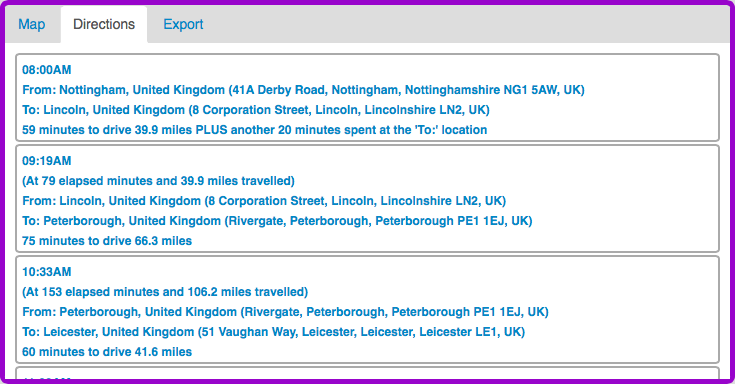 A 'Timeboxed Location' checkbox option for each Route Location, each initially un-ticked. 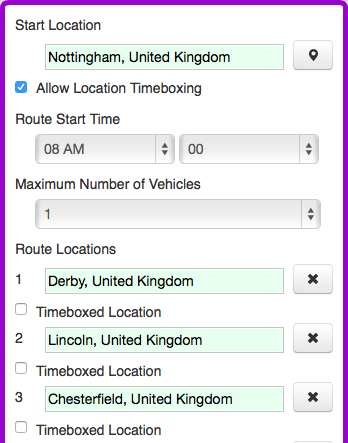 If a Route Calculation is performed at this point, it will behave in exactly the same manner as a 'normal' non-timeboxed calculation, except that the Directions tab will also include the Route Start Time and the time of day that each location on the route is visited. This may be useful if you simply want to know what time of day each location will be visited. You are now presented with the further options of specifying that the location must be visited after a certain time or day, or before a certain time of day, or both. You can also specify the amount of time to be spent at the location before moving on to the next (which by default is set to zero time spent waiting). In order to satisfy the 'Lincoln by 9AM' requirement, Speedy Route re-orders the route location so that Lincoln is visited first, before moving on to the next location. The route above arrives at Lincoln by 8:59AM, before waiting for 20 minutes and leaving Lincoln at 9:19AM. The journey onto Peterborough is another 75 minutes (1 hour and 15 minutes), arriving at the next stop Peterborough at 10:33AM. 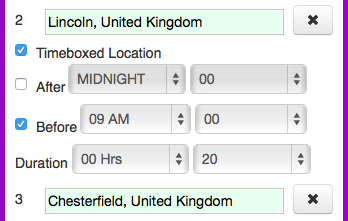 One more point to remember is that the maximum percentage of locations in your route that can be timeboxed is 25%, i.e. 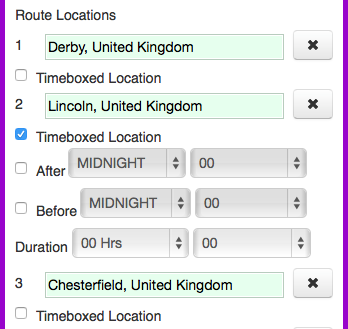 no more than a quarter of your route locations can be timeboxed.